SUPER BRIGHT & BE SEEN CLEARLY - Utilize high brightness LED chip generating super bright light,180 degree visibility and 200 meter distance.Keep you 100% visible even in daytime. COLORFUL 5 MODES WITH MEMORY - BYB bike rear light featured 5 modes (red,red flash,blue,blue flash and police flash) to ensure your safety on the road.The bike back light will turn on in the last mode accessed. 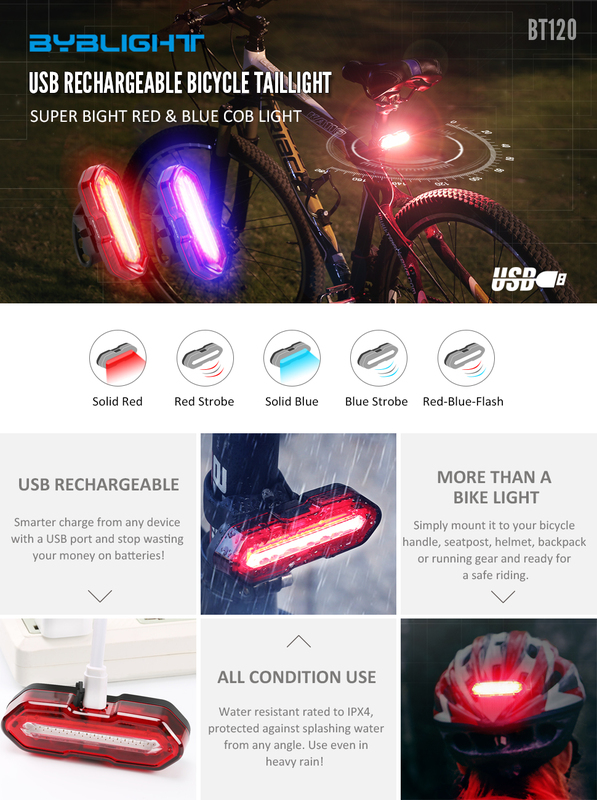 USB RECHARGEABLE - This bike rear light support USB rechargeable and it can connect any USB output interface via USB cord(Included) such as power bank,computer or laptop. EASY INSTALLATION IN SECONDS - No longer spent time installing.Use integrated environmental silicone as strap and totally ensure mounted in seconds without any tools.True single-hand operation. VERSATILE AND NO HASSLE: Not only as a bicycle rear light, it can be used on helmet as a headlamp.We also prepare a 18 month warranty for this bike light. Have you ever run out of batteries unexpectedly when you are enjoying a perfect ride? BYBLIGHT latest super bright rechargeable bike tail light have 5 modes which keep you 100% visible in daytime and keep you 100% safe on the road. COB LED,5 modes and wide 180 degree visibility ensure you are seen farther away even on a busy street during the daytime. Except as bike tail light, since its easy installation, it can be mounted on helmet,your backpack to keep safe even on wheel as a decoration. Utilize a USB cord(Included) to connect all kinds of power source with standard USB port and own automatically fully charged cut-off system. Distance makes the hearts grow fonder.Tail light ensures you get more safer.